Did your family have a favourite family recipe as a child? Well, if you did, you are not alone: if you enter the term “family favourite recipes” into Google, you will get quite a few results – 27 million results to be exact. As you look through them, there is obviously some regional variation: for instance the UK lists are full of things like chicken tikka masala, fish pie, or sticky toffee pudding; whereas in the US you are more likely to find fried chicken, mac ‘n cheese and chocolate brownies. But I always think that each family is so unique and meals acquire significance in so many extremely persoal ways that such lists are close to being meaningless. They become merely collections of easy-to-make crowd pleasers, rather than any sort of reflection of any real family, its complicated relationships, its crazy preferences, its quirky references and its favourite meals. When I was a little girl, one of my favourite foods was chicken a la king. As it was also a classic “family friendly” dish, my mom often made it when we had visitors with kids – those halcyon days when the adults sat at one table and the kids got a table all to ourselves in the corner of the dining room. On one such occasion, my mom dished up for us and left us to our own devices as she served the other guests. After staring at his food for a good few minutes in mute horror, little Harry suddenly grabbed his plate and dashed to his mother’s side at the table. “What is it?” she asked. “Mommy! Mommy! take the pooh out!” wailed the clearly affronted Harry. You could almost hear the collective intake of breath as the adults wondered what the hell had been happening at the kids’ table while their backs were turned. But as it turned out, the “pooh” he was referring to was the mushrooms – their little black gills evidently offended him. Or there was the time that my mom made really rather delicious pilchard fishcakes for lunch, but my brother spent an inordinate amount of time pushing them around his plate and not eating anything. When he eventually asked to be excused from the table, having eaten almost nothing, my mom asked if something was wrong. “What’s wrong”, he blurted out, “is that these fishcakes taste the way I always imagined catfood to taste!”. (Evidently, my brother’s survival instincts had not yet fully developed by this stage!). Both of these meals remained on our family meal rotation for years to come, never to be enjoyed without some reference to these anecdotes that had become so fused with the dishes in our family’s folklore. To me, that’s what family favourites are all about. Did your family have any favourite meals or stories like this? I was recently fortunate enough to be sent a review copy of the latest cookbook by the legendary Giuliano Hazan, entitled Hazan Family Favourites. Giuliano, the son of Italian cooking icon Marcella Hazan, is an author, teacher, entrepreneur, and considered by some to be one of the foremost authorities on Italian cooking. Although born in the United States, Giuliano spent much of his childhood in Italy where he learnt to love and prepare traditional Italian dishes. But Hazan Fam­ily Favor­ites is not so much a book of Italian recipes as it is a book about Giuliano’s family, with food as a parallel plotline. There are plenty of photographs scattered throughout the book, both of Giuliano as a child, as well as grandfathers, nonnas, his parents, his daughters and his wife Lael. Having leafed through the book, you feel as if have had a peek into his family photo album – and what an interesting album it is. His maternal grandparents were from Emilia-Romagna and were clearly a huge influence on him. His paternal grand­par­ents were Seph­ardic Jews who settled in Italy but later fled to the United States. Add to this the fact that his maternal grandmother spent some time in Egypt and brought back some Arab-influenced recipes, and you have a rich seam of recipes – and family stories – to mine. The book is well laid out and written in Giuliano’s conversational yet unfussy style. 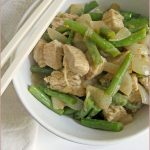 Most recipes are accompanied by a recollection of making or eating the dish together with a family member and all are written in clear and concise language, with useful features like “time from start to finish” (am I the only one who hates having to add up cook time and prep time to get to a total?!). But best of all is that although the book is full of beautiful photos, it is not the sort of coffee table recipe book that you will page through once and then leave on the shelf to look pretty. It is a book that makes your fingers itch to begin cooking; a book that makes you think about your own family’s story, and the foods through which it might be told. Peel and finely chop the onion, crush the garlic. Chop the tomatoes roughly and set aside. Slice the chicken into two or three thin fillets – flatten them a little with a meat mallet if necessary. Heat the oil in a large frying pan until hot (try dropping a crumb in it – it should sizzle) and then add the chicnek fillets. Fry until beginning to brown and slightly crispy at the corners, then flip over and repeat on the other side (about 4 minutes per side). Remove from the pan and keep warm. Remove the pan from the heat and add the onions and garlic (I added an extra drop of olive oil as the pan was quite dry by this stage). Fry over gentle heat till the onions become translucent but not brown. Add the tomatoes and continue to cook for about 5 minutes, then add the oregano. Cook for another 5 minutes, until the tomatoes are no longer watery, then add the olives and capers. Add the chicken fillets back into the pan and heat through before serving. And in other news… my article and photos on Corfu island appear in the latest issue of Crush online magazine – check it out on pages 38-39! 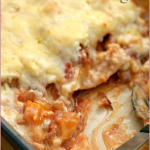 Yes, it seems most families have a favourite family recipe… This dish is wonderful. Just so tasty and droolworthy! We’re one of those families without a favorite recipe. Well if you don’t count Mac and cheese as a real meal..;) That’s what you get with a mum who hates cooking! But this looks delicious Jeanne! I don’t have DSTV at home so I don’t get to watch a lot of those channels. I just spent a week in Durban at Indaba and stayed in a Garden Court so had DSTV in my room. Most of the time the channel was on BBC Lifestyle and I loved all the cooking shows. Thought of you quite a lot. Roast chicken was always one of our favourites – in those days more of a treat than roast beef. I think it was before battery farms made chicken the cheapest meat of all. What I want to know is how my mother managed to carve it so that half of the chicken served the four of us for one meal hot, to be followed by the other half as cold chicken salad the next day? She managed to slice the breast so that we all had a generous slice of white meat too. With my family of five the chicken is pretty much demolished after just one meal, with only a wing and a drumstick left for the next day. Either the chickens have shrunk or that one extra child is fatal to domestic economy! 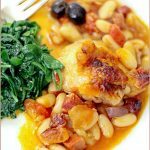 I’ve always loved Marcella Hazan’s books, but I haven’t yet tried Giuliano’s recipes, though I do follow their blog. Will have to look out for the book. This is such a wonderful book and not only for the delectable, well-explained recipes – but the family history is fascinating. I love mine as I love the other two Giuliano Hazan cookbooks I own. Now I have to try this recipe. It looks fabulous!